THE RARE BREED—– 1966 yawner is such a nothing of a story, about a ‘headstrong’ widow introducing Hereford cows to the States while having her attentions fought over by two men, that one wonders what exactly drove James Stewart, Maureen O’Hara and Brian Keith into their contracts. Jimmy and Maureen had worked together four years earlier on the delightful Mr. Hobbs Takes A Vacation but they didn’t mesh as well—professionally or personally— this time (her amusing bio points this out). The feisty redhead had also worked with Keith, twice, on the classic The Parent Trap and the awful The Deadly Companions. Cheap production values (Universal being chintzy) give it a why-bother? 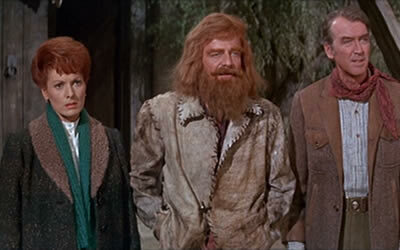 look, and 97 minutes drag by under the “cut, that’s good enough” eye of director Andrew V. McLaglen. Keith hams as never before, his Scottish brogue and obvious pasted-on beard and wig worth a few laughs, if you can stay awake. Again, a rich gallery of veteran supporters: Juliet Mills, Don Galloway, Jack Elam, David Brian, Ben Johnson, Harry Carey Jr., Perry Lopez, Gregg Palmer. It cow-flopped in at #49 for the year.